Many times you have heard us say, “Use lotion the night before, do not use lotion on your legs right before putting on your stockings.” Our opinion and our manufacturers opinion has changed on this issue. We asked you not to use lotion right before donning your stockings because many of our great customers wear garments with silicone bands. If the lotion gets on the silicone band, the band is likely not to keep the garment up and will allow it to slip down. There is a simple solution to this problem…dampen a cloth with rubbing alcohol and rub the band to remove the lotion. This should also be done about once a week to remove body oils from the silicone band which normal laundering will not remove. Rod and I recently had the opportunity to spend a few days on one of the beautiful Florida beaches (before Hurricane Irene). Our time there made me much more aware of what some of my customers have been telling us. I don’t know if you are familiar with the weather in Amarillo, Texas. We are “high and dry”…the altitude is about 3,600 feet and our normal yearly rainfall is about 19.5 inches (not so this year). So when our clients complain that their stockings are so difficult to put on because it is so hot or hot and sticky, well, I felt most people have air conditioning so their house is dry. Ha! Ha! While we were on the beach the temperature was 100 degrees and the humidity felt as though is must be at least 90%! Nothing seemed to ever dry out (even in our room)! After I took a shower and attempted to put my 20-30 mmHg pantyhose on, it was almost impossible! 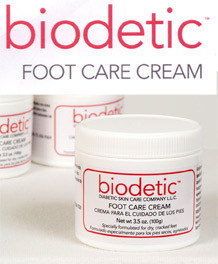 I did find it was much easier if I made sure I used my biodetic cream on my heels and feet first. It was a definite must to use my Sigvaris donning gloves (can’t live without them). The biodetic allowed the stocking to glide more easily (if there is a more easily when it is that hot and humid) over the foot. Please remember the lotion or cream you use on your feet or legs should not contain any petroleum products. They can break down the elastin in your garment. If any of you have had similar experiences, please let us know by scrolling to the bottom of the blog entry to leave a comment. You can leave it as a guest and not have to log in.